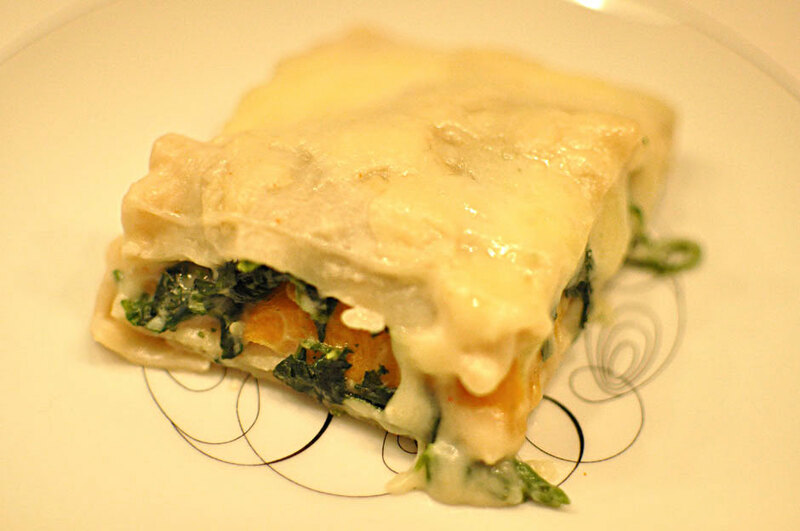 I love lasagne in the winter so I created this version with veggies and a low fat white sauce. This takes a little longer to make, so I save this for a weekend dish. I use Tinkyada Organic Brown Rice Pasta Lasagne noodles from Whole Foods. Peel squash and slice into thin pieces. Lay pieces flat on baking sheet, brush with olive oil, and roast in oven on 350 for approx 20 minutes or until soft. Sprinkle with garlic salt. Sauté garlic in olive oil. Add spinach and cook until excess water is removed. Prepare white sauce and pour over top of lasagna. Top with remaining 1/3 of cheese. Bake uncovered in oven at 350 degrees for 30 minutes. Remove from oven and let sit for 5-10 minutes before serving. Melt the butter in a saucepan over medium heat. Add the garlic and stir for 1 minute; do not brown. Stir in the flour to make a thick paste. Pour the milk in slowly, stirring rapidly (I use a whisk), for 1 minute. Cook and stir a few minutes until thick. Add a pinch of cayenne and salt to taste.